Straddling along the spectacular Milky Way Band, CASSIOPEIA the Queen (left in image) & CEPHEUS the King (right in image) are certainly a royal and star-studded couple! 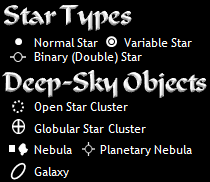 A variety of star bodies can be found in both, including plenty of open star clusters in Cassiopeia, a few galaxies (three of them, NGC 278, 147, & 185, are more south of Cassiopeia than what the image shows), and beautiful nebulae. 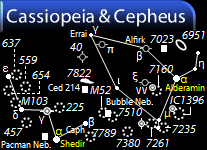 While Cassiopeia is known for famous nebulae, like Pacman Nebula and Bubble Nebula, Cepheus boasts a few interesting stars. One of them is the Garnet Star (μ), a large supergiant noted for its deep red color; another is Delta (δ) Cephei, a Cepheid variable star in which brightness changes as it pulsates. In addition, Cepheus has quite a collection of spectacular nebulae as well, like the luminous Iris Nebula, vast Elephant's Trunk Nebula (IC 1396), and neat Bow-Tie Nebula (NGC 40 - planetary nebula)! You'll find Andromeda, Cygnus, Lacerta, & Perseus south of Cassiopeia & Cepheus, while Draco is east of Cepheus, Camelopardalis is west of Cassiopeia, and Polaris (at the tip of Ursa Minor, the Little Dipper) is north of Errai (the 'crown' star in Cepheus). Second Brightest Star: Caph (2.28) (the lower the number, the brighter).